In 2005, NHTI captured the USCAA national championship this year completing a record setting 31-3 season defeating Golden State Baptist 72-70 in the Division II championship game. Hogan’s basketball teams are well known for their relentless fast paced style of play and aggressive full-court defensive effort. On January 21, 2015, Hogan earned his 500th career coaching win with the Lynx defeating rival VTC 92-80. 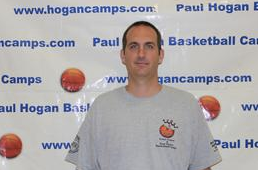 Hogan has been honored numerous times with YSCC Coach of the Year. Basketball Coach of the year award along with the YSCC award. In February 2019, Hogan will receive the prestigious James W. Desmarais award for his continued service to NH Athletics. The NHTI Capitals (now Lynx) are recognized as a leader in small college hoops comprising winning seasons and a program that is often visited for recruiting purposes by Division II and Division III coaches. In 2002, NHTI was the USCAA Division II National Runner-Up finishing with an astonishing 29-4 record. Hogan’s NHTI teams have become recognized as teams that will competed for the USCAA national tourney the last four years. In his eight years at Plymouth State College, Paul Hogan composed the highest winning percentage of any men’s basketball coach in the school’s history at 136-80. His unique coaching style and dedication to the fundamentals of the game guided the Plymouth State Panthers to postseason play in the prestigious NCAA Tournament and numerous ECAC berths. Hogan was recognized as the Little East Coach of the Year in 1991 and 1998. Hogan is active in his many duties at NHTI chairing the annual NHTI/Delta Dental 5 K Benefit road race at NHTI every April that raises scholarship money for the Jen Kemp Scholarship fund and the Boys and Girls Club Scholarship for NHTI students. In 2012, the Boys and Girls Club Classic was established as a series of yearly basketball contests between Plymouth State University and Rivier University with proceeds from the men’s/women’s doubleheader being put into another scholarship fund for NHTI students named the NHTI Boys and Girls Club scholarship. Hogan is a regular speaker at graduation ceremonies, team banquets, youth coach’s clinics and at career days around New England. The NHAHPERD conference in Waterville Valley is just one example of Hogan’s commitment to the youth of NH and the professionals that serve the greater New England area. 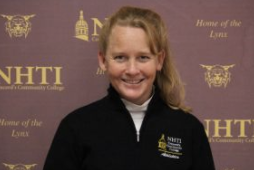 Athletic Director and Professor of Sports Management at NHTI are the full time duties for Hogan year round. In addition to his NHTI duties, Hogan serves the Yankee Small College Conference as the conference President from 2005-2016. Prior to the YSCC formation, Hogan served as the NNESCC President and YSCAA Vice-President from 1999-2005. 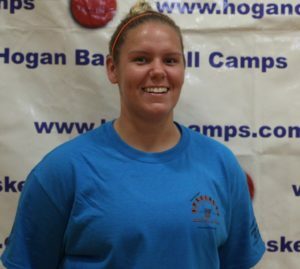 Hogan’s background in physical education, coaching and recreation has proven to be very helpful with creating camps and clinics that offer campers a special experience growing on the court and off the court. An adjunct for Plymouth State University, Endicott College and Southern NH University are other examples of Hogan’s commitment to continuing to educate the future leaders of education, sports business, administration and coaching. Conner Lane is a graduate of Keene State (2016 BS ED) and currently teaches elementary physical education in Merrimack NH. Coach Lane currently assists Coach Johnson at NHTI on the Lynx coaching staff. A graduate of White Mts. Regional High School, Lane was a stellar three sport athlete and served as a team leader as a captain for many of the Spartan teams. 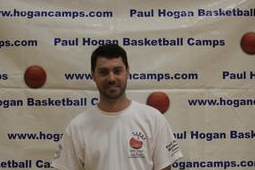 Coach Lane has been a member of the Hogan Camps staff of camps for the many years. David Levesque is a graduate of PSU 1992 BS ED/1996 MED ) and currently the head girls coach at Plymouth Regional High School after many years at Laconia High School (Boys & Girls head coach) and a number of years assisting Coach Hogan at PSU. A PSU Hall of Famer, Coach Levesque was known for his sharpshooting skills and is one of the all-time great scorers in Panther history. Meagan Short is a graduate of Daemon College (2015 BS ED) and serves as an assistant women’s coach on the NHTI Lynx coaching staff. A fine player at Timberlane High School, Coach Short studied Athletic Training at Daemon and played on the women’s hoop team as well. Short has been a long time coach at Hogan Camps. Heidi Crockett is a veteran coach with a fantastic background in many athletic circles here in NH. Coach Crockett has enjoyed two very successful seasons as the head coach of the NHTI women’s soccer team helping lead the Lynx to the YSCC conference title in 2014. Her background in sports is extensive and passionate with experience at many different levels as a coach and a player involving soccer, softball, lacrosse, and basketball. Coach Crockett is a native of nearby Gilmanton, NH where she owns and operates Crockett Titles. She graduated from California University of Pennsylvania in 2015 with a degree in Sports Management with a Wellness and Fitness concentration. Heidi and her husband Brian have three children Chelsea, Cassie, and Chad who also played baseball at NHTI. Dan Jacobs is a graduate of PSU (2006 BS/PE) Physical Education teacher at Chester Academy (NH) schools teaching physical education and Adventure Education. He coaches and works with both of the middle school basketball team and is also coaching the soccer and baseball teams at Chester. Coach Jacobs was an active participant in many different physical activities during his time at PSU and has a coach with Hogan Camps since 2010. 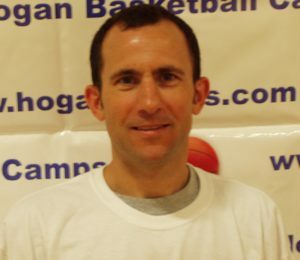 Campers can expect to work with Coach Jacobs at Rip City Basketball Camp, the Point Guard & Post Player camps, Shooter’s Gold Basketball Camp in Hooksett and the Specialty Basketball Camp. 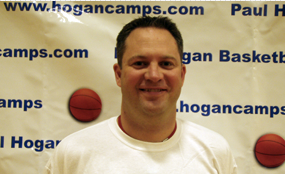 Ben Hill is a graduate of Bryant College (1994/BS/Bus) and has served as both a men’s and women’s basketball assistant at NHTI in Concord under Coach Hogan and Coach Shelly Winters. Coach Hill is a former assistant at Pembroke Academy where he was a stellar 2 sport athlete in baseball and basketball. Hill is currently the assistant principal at Belmont Elementary School. 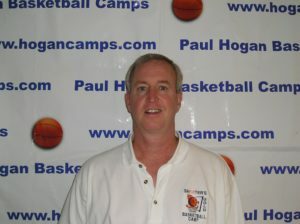 Coach Hill begins his tenth season with Hogan Camps serving as an assistant director specializing in post play. 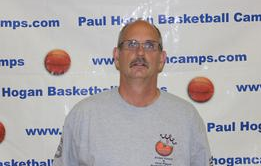 Coach Hill will be working with the Shooter’s Gold Basketball Camps in Gilford and Laconia. Dala Johnson is a graduate of SNHU (2012 BS ED) and took the reins of head coaching the NHTI women’s basketball program in mid-October 2018. Coach Johnson is currently teaching math in the Litchfield, NH school district. 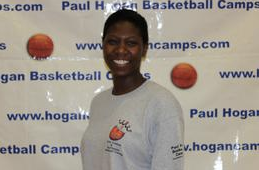 “Princess” Dala has a long history with Paul Hogan Basketball camps starting at a very early age as a camper, then counselor and now as a coach. A very fine player at Timberlane HS, Dala played basketball at the University of Maine and then SNHU. The daughter of Bruce Johnson, Dala is a terrific teacher and role model for our young players and will be at many of the summer camps including the Point Guard & Post Player camps. Bruce Johnson is another graduate of PSC (1974 BS/PE) and is currently the varsity girls basketball coach at John Stark Regional High School after many years at Timberlane High School. Coach Johnson is regarded as the finest foul shooter in PSC history and still owns several PSC records for shooting and shooting percentage. Coach Johnson has been a long time friend and supporter of Coach Hogan’s camps serving in many capacities over the years. He is the father of Evan, Dala and Elise Johnson who work every summer at several camps throughout the summer. Evan Johnson is a PSC graduate (1997, B.S./Bus.) (MED, PSU 2006) and a very well-known coach on the summer basketball circuit. He was a member of 4 fine PSC teams playing the off guard and small forward positions and known as a very good shooter under Coach Hogan. Since graduation, “The Big E” has been coaching and working at various high schools including Timberlane H.S. while working summers for Coach Hogan’s summer basketball camps. 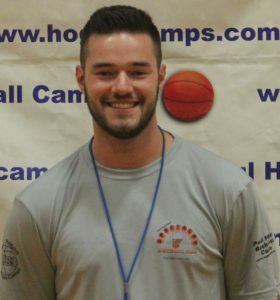 Coach Johnson is well rounded in his ability to coach boys and girls on the finer points of basketball and is a physical education teacher at Fairgrounds Middle School in Nashua, NH. An outstanding basketball official, Coach Johnson can be seen running up and down the “courts” all over NH throughout the four seasons. Derek Johnson is currently the head girl’s soccer coach and assistant director of admissions at St. Paul’s in Concord and previously coached the men’s soccer team at NHTI. 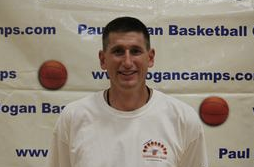 Coach Johnson has over 20 years of coaching at various levels in New England. 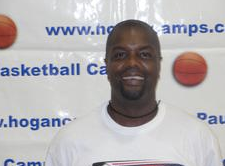 Coach Johnson led NHTI to numerous YSCC conference titles and USCAA appearances during his tenure as the head coach. He was named the YSCC Coach of the Year in 2008 & 2009 and the Maine Athletic Conference Coach of the Year in 2000-2001. Working closely with former NHTI men’s soccer coach Don Welford, Johnson helped design the highly successful Play On! Soccer Camp. Now entering the 5th year of existence, Coach Johnson has teamed with current NHTI head women’s soccer coach Heidi Crockett to help establish Play On! Soccer Camp as one of the best camps and values in the NH soccer community.